Trying to get your techno-obsessed kids to look up at the world? 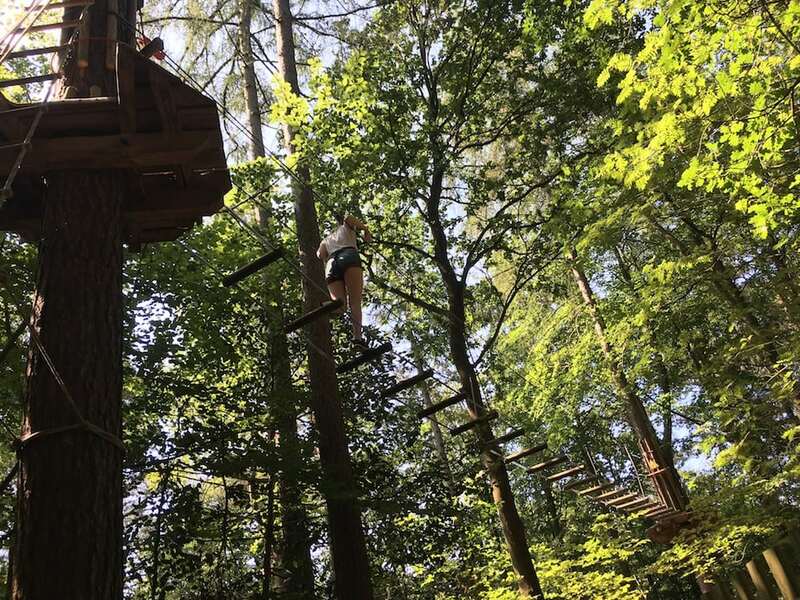 Muddy's Sarah o'Hanlon does one better and sends her three teens high into the tree tops at Go Ape in Black Park. Guess what? They LOVED it! It takes something pretty special to prise my three teenagers (girl 13, boy 16, girl 19) away from their screens and get involved in a family day out. But my suggestion that we all go ‘en famille’ to the forest adventurers/tree top climbers Go Ape was a surprise success. So with hastily-assembled picnic in the back of the car, we headed off to the Black Park Country Park near Wexham (below). I know Hero is a big fan of this park because she wrote about here back in 2012 when Muddy Stilettos was barely a twinkle in her eye! 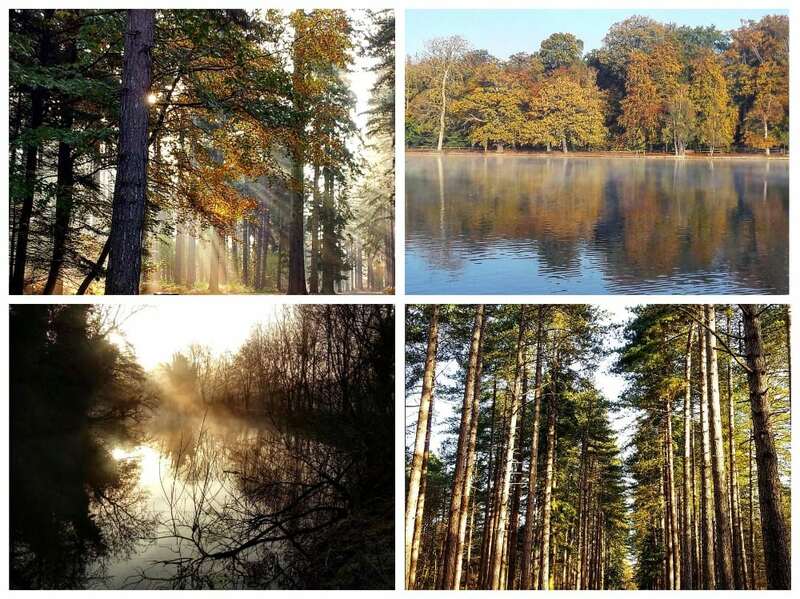 Basically there are 530 acres of woodland and a pretty lake that you can explore on foot or bike (usefully, you can hire them there) or even those funny Segways if you really can’t be bothered to put one foot in front of the other. There’s a huge children’s playground that will keep them occupied for hours and a cafe nearby. And then of course there’s the Go Ape High Ropes Adventure that, on my experience, trumps the lot. 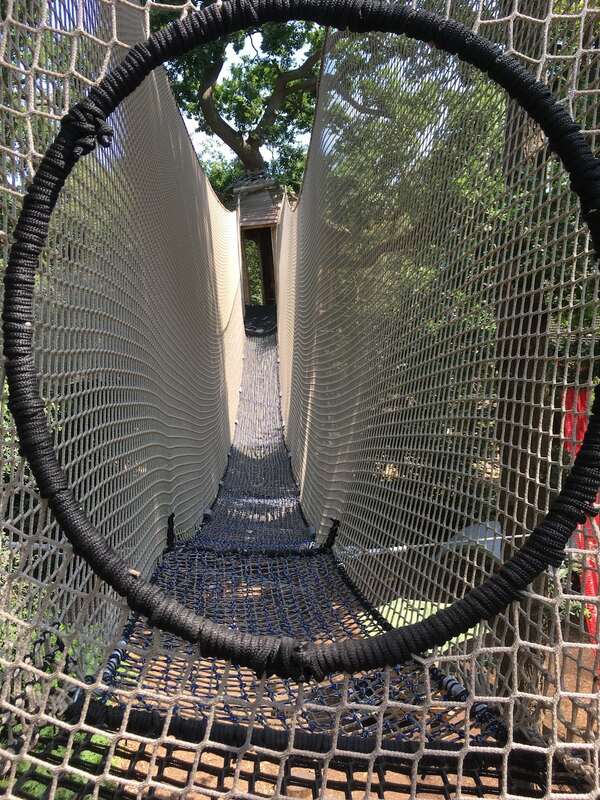 A 2-3 hour adventure of tree top zipping, climbing and swinging across a huge 1km course . It’s challenging but very do-able for most reasonably active people. I was definitely a bit nervous (my kids of course weren’t at all) and it’s worth knowing that if your kids are under 16 an adult absolutely has to go accompany them. 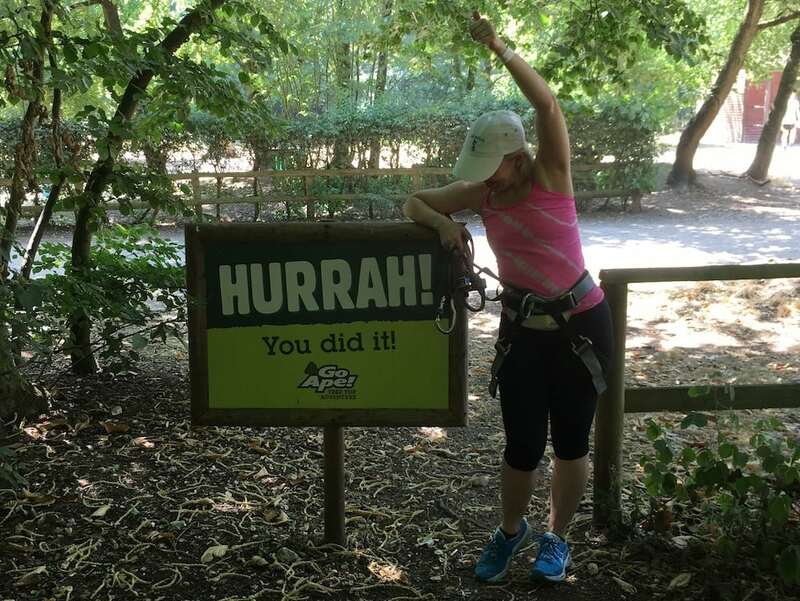 Go Ape has been going since 2002, now in an incredible 33 locations, so they they have the briefings down to a fine art – super-secure harnesses and we practiced attaching and detaching ourselves from various harnesses. You can spot members of the GoApe staff roaming around, seemingly very casually on ground level, particularly at the start of the course while people are getting used to the clips and ropes, but they were eagle-eyed enough to somehow spot me hesitating as to where to fix my carabiners (metal loops, yeah) on the first swing. After that it was plain zipping and I soon got used to the whole process of clipping and unclipping – the Go Ape mantra ‘Always Stay Attached‘ is still ringing loud and clear in my head. My kids were immediately leaping through the treetops, with pretty much no sense of fear. 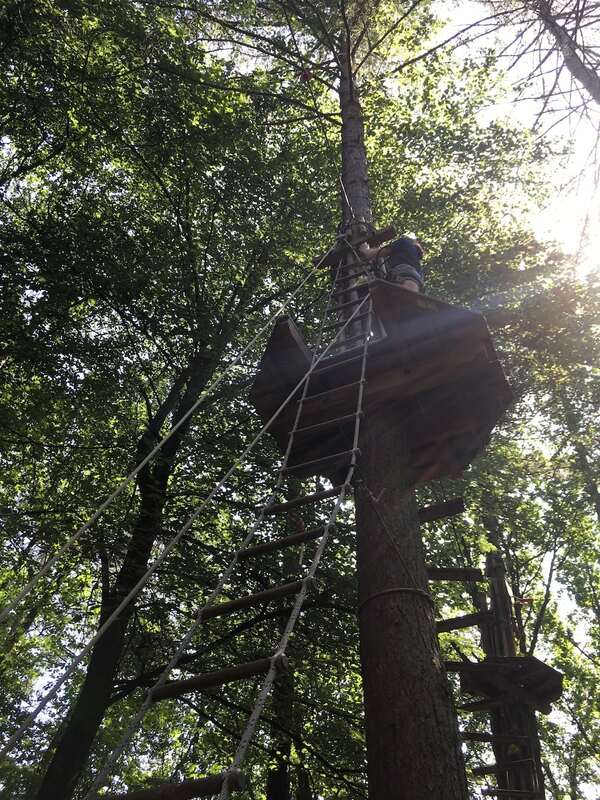 It was really peaceful and beautiful up there but for me there were some bits that were pretty challenging – good news is there are a couple of points where you can choose the less ‘adventurous’ option and meet back at the next tree top. The 166m zip wire at the end is the crowning glory of these tree top adventures – it’s sooooo much fun. My children, of course, made sure they did the zip wires first so they could stand and point and laugh hysterically at my inelegant crash landings. Bless. But hey, anything to entertain. A lovely day out and rare to find an activity I can do with my teenage kids. The whole trip left me feeling quite glowy, proud and happy – it made me realise too that it’s so worth getting up a bit earlier at the weekend and making the effort to do something different once in a while. 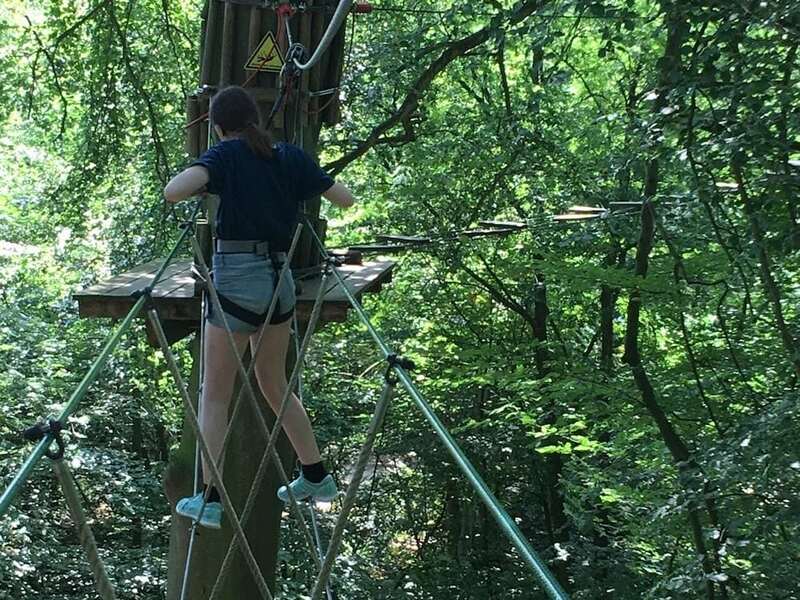 The Tree Top Adventure is suitable for ages 10 plus and is also dependent on height (if they’re not 4ft 7″ or over, they’ll refund or offer the Tree Top Junior which is for 6+ years and open to the whole family). 16 and 17 year olds can supervise themselves but not others. Even tinier tots? The latest addition to Black Park is the Nets Kingdom. 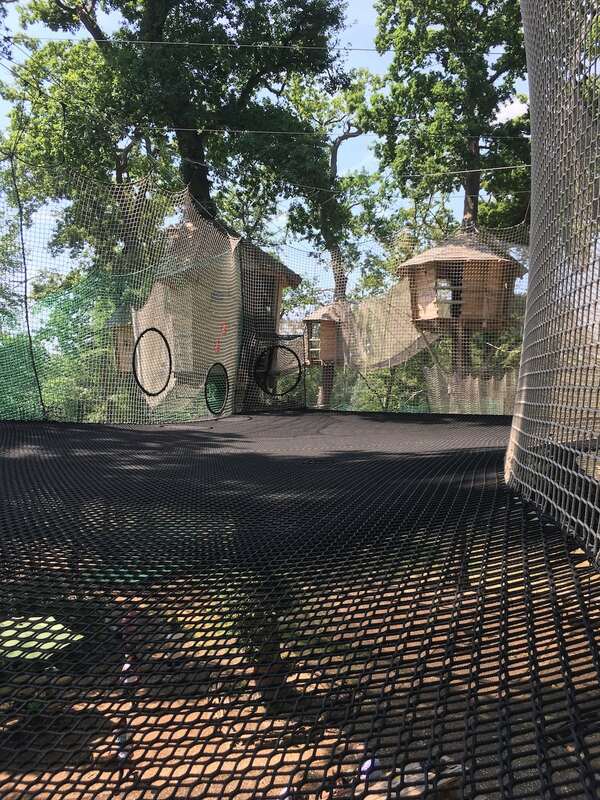 This is an amazing network of really heavy duty treetop netting, ball play areas and tree houses for toddlers from 1 upwards. 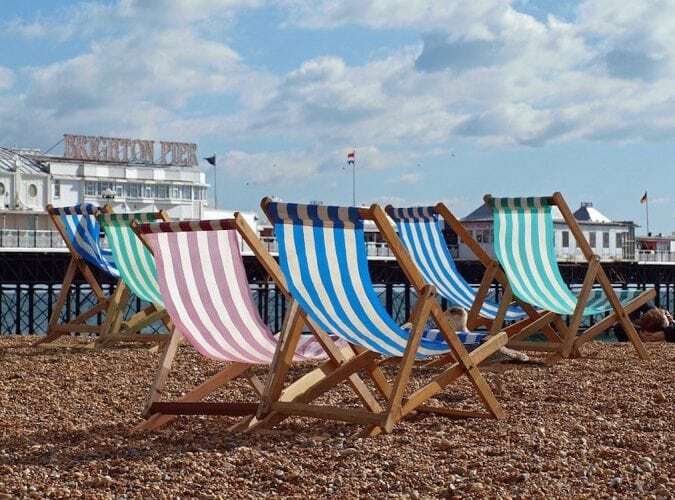 We did try it out too while we were there – I even queued nicely with a row of five year olds for my turn on the slide! There are huge bouncy netting areas which are lots of fun with loads of space for little ones to let of steam and play. 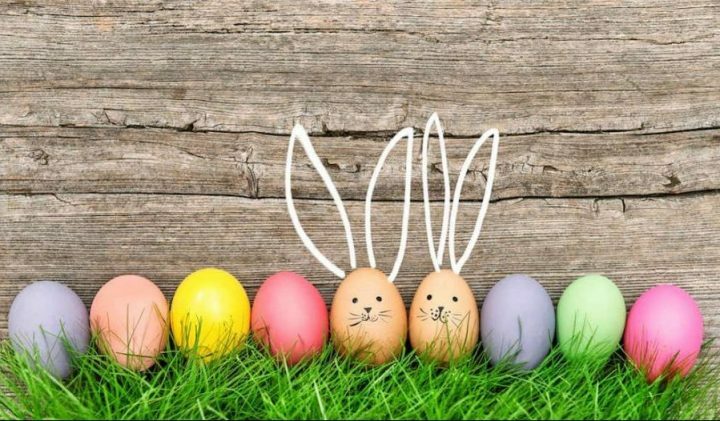 The best Easter Egg hunts!